More advanced one-day workshops can follow the basic weekend workshop. We deepen the exploration of the Alexander Technique principles and the application of them to Dressage. These workshops relate to the Classical Dressage principles of Suppleness, Rhythm and Impulsion. In the morning sessions, we explore horse and human movement through experiential exercises. 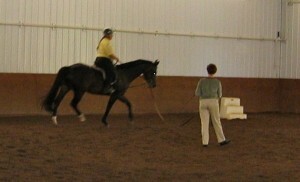 Longe lessons in the afternoon deepen the morning practice and work toward the classical dressage seat. Students receive generous individual attention and hands-on guidance both on the horse and off. Constance is available by e-mail in-between sessions if students have questions about the theories and principles. 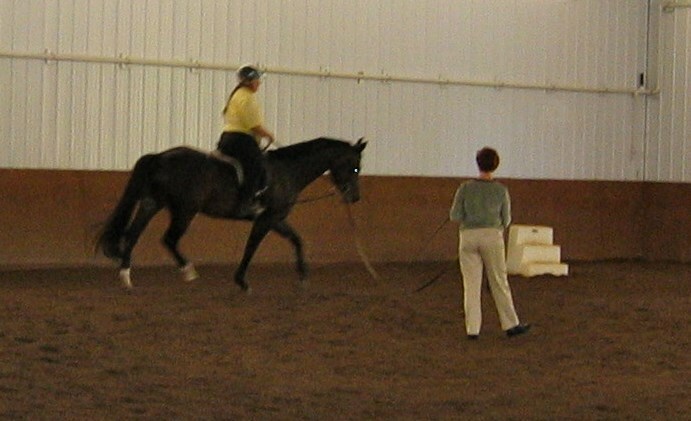 The first workshop focuses on the startle pattern in both humans and horses, and the process of un-doing this “fight or flight” reaction while in motion. This work corresponds with the dressage principle of suppleness. Creating more ease and resilience through the head/neck/back relationship is integral in the training of both the horse and the rider. The second workshop focuses on breathing coordination in both horses and humans. This work corresponds with the dressage principle of rhythm. Working with breath in relation to the horse’s rhythm adds another layer of connection and control to the horse/rider relationship. The third workshop focuses on the extension and contraction of the spine in movement of humans and horses. This work corresponds with the dressage principle of impulsion. When a rider can consciously lengthen and shorten her spine without tightening, the horse can respond with better balance and throughness, enlivening the circle of energy.